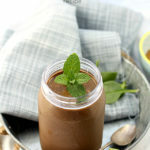 Creamiest kale banana smoothie that tastes just like a milkshake! 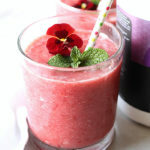 Packed with antioxidants and a healthy way to curb a sweet tooth. Growing up kale was never really a part of the daily menu. 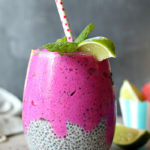 But today is has grown tons of popularity due to it being one of the worlds most powerful “super foods.” It is rich in tons of antioxidants, nutrients, vitamins, folate and magnesium. 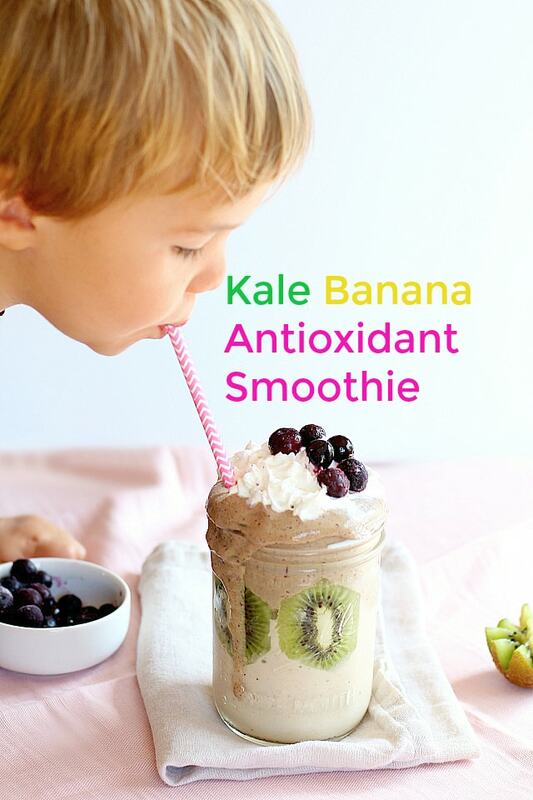 One of the most favorite ways to enjoy kale is in smoothies! Sitting with Chase his request for smoothies is usually dadda’s smoothies. Or recently he has requested cantaloupe smoothies I think because he is obsessed with cantaloupe fruit. 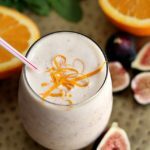 Poor first child was the guinea pig of all this mamas smoothie recipes which I am proud to say has evolved into epic recipes that tastes just like milkshakes! Trial and error, right? I totally suggest enjoying smoothies in wide mouth mason jars. 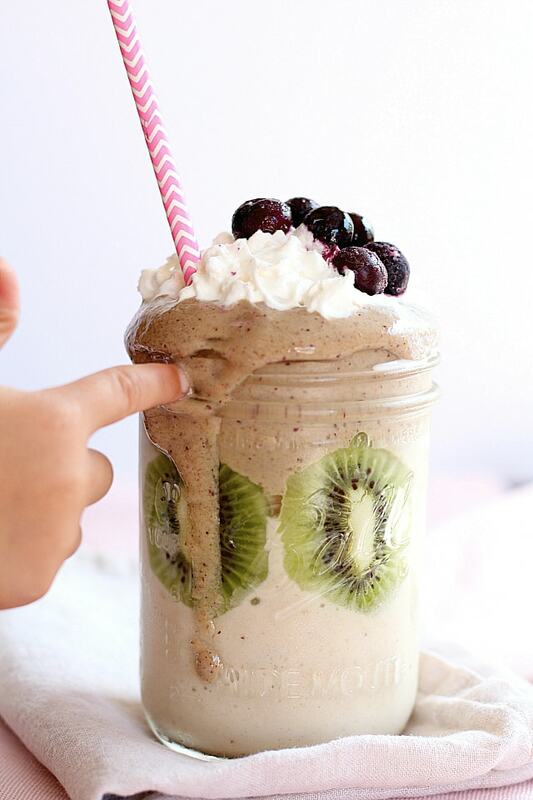 We love using these ones by Fresh Preserving is one of our favorite ways to serve thick smoothies because there is enough room to use a spoon for scooping extra fruit and toppings out. How delicious does this kale banana smoothie look as it slowly drips off the sides of the jar?! After shopping our local market we grabbed some kiwi and so I wanted to make a healthy green smoothie using our fresh fruit. When I added the banana, milk, kale and kiwi it needed something a little more to sweeten it up. Frozen blueberries and strawberries are always in the freezer so we added blueberries to the kale banana smoothie for an antioxidant boost! 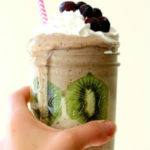 Make this kale banana smoothie into two easy layers for a beautiful sweet treat! First make the bottom layer with just banana and goat milk or coconut milk. Pour 1/2 the mixture into your glass. Then (for the pretty kiwi on the sides) line the sides with slices of kiwi and smash them on the sides slightly. 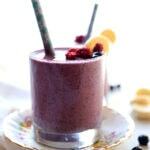 To the rest of the banana mix add kiwi, kale and blueberries. 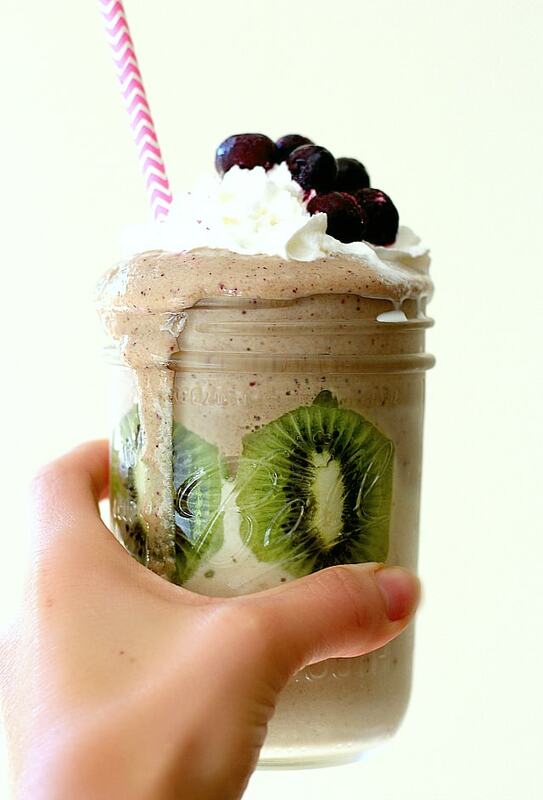 Pour kale fruit smoothie mixture on top and top with whipped cream! Curren just could not wait for take the photos and was climbing up the whole time trying like a puckering fish to get his sweet lips wrapped around that straw! Seriously a delicious treat that we love to eat around 3:00 to hold us over for dinner. Kale banana smoothie totally soothes after school HANGER pains! In a blender blend milk and frozen banana slices. Pour half the mixture into two glasses. Add to the blender (with the remaining banana and milk mixture) frozen blueberries, kale and kiwi fruit. Pour equally into both glasses. Top with whipped cream and more frozen blueberries.